Update: The very same deals are offered through Target’s Mobile Store which is powered by Simplexity, the same company that operates Wirefly. If you’re looking to score a deal on the newly launched Windows Phone 8X and Lumia 810, Wirefly might be the best place to look. Right now the Windows Phone 8X is available for $129 on both new lines and qualifying upgrades. 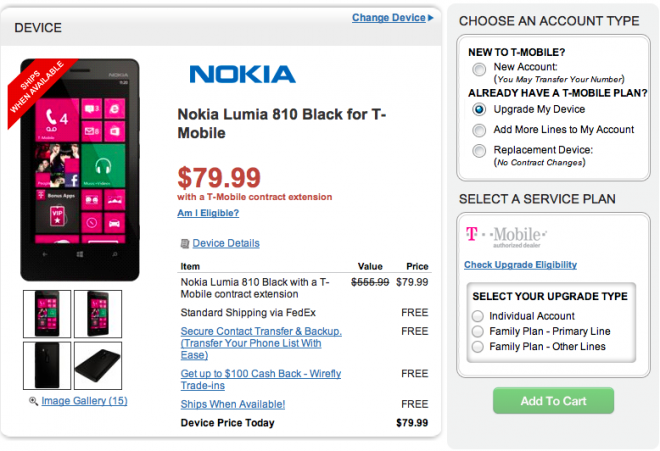 The Lumia 810 will run you $79 for new lines and qualifying upgrades. Overall, these are better deals than T-Mobile’s own pricing, so I’d take a long hard look at Wirelfy.com if you’re looking to grab one of these today. Lumia 810 on a Classic Plan is $149.99 after a $50 mail-in-rebate card and with a two-year service agreement on qualifying voice and data plans. The Windows Phone 8X on a Classic Plan is $199.99 after a $50 mail-in-rebate card and with a two-year service agreement on qualifying voice and data plans. As you can see, Wirefly is offering some great deals. Even better is the pricing on the Wirefly Friends & Family site; $49.99 for the 810, and $99.99 for the 8X. Am I missing something? This is the same price as through your ‘store’ isn’t it? WARNING: I just tried Target, and they try to make you change your plan, even if you’re upgrading. *, so you can keep your existing plan if it is still available to order. Which is nice and all. But my particular plan has not been available to order in a long, long time. and I would like to keep it as long as T-Mobile will let me. If you have a legacy/grandfathered plan, forget about 3rd party dealers – always go to a corporate T-Mobile store. I ordered the 8X from Target and it didn’t try to make me change my plan. On the initial product screen, when you are checking boxes off on the right, first select Upgrade My Device. Then above the Upgrade Box, there is a little link to Check Upgrade availability. The first time i went through, I didn’t follow that link and it did try to change my plan. When I restarted and clicked on that, my order says no changes will be made to my existing plan. Hope that helps! Just something to think about — When buying a phone through Wirefly, the ETF may be higher than T-Mobile’s ETF. well, it is missing key android features, like lag, weekly reboots, and app crashes. Time to get rid of your G1…. this is 2012.. almost 2013..
2013 comes and Android will still be the half assed OS data mining project brought to us by Google. So whatz your point… Anyway, why would anyone buy windows OS unless its free. let me know. 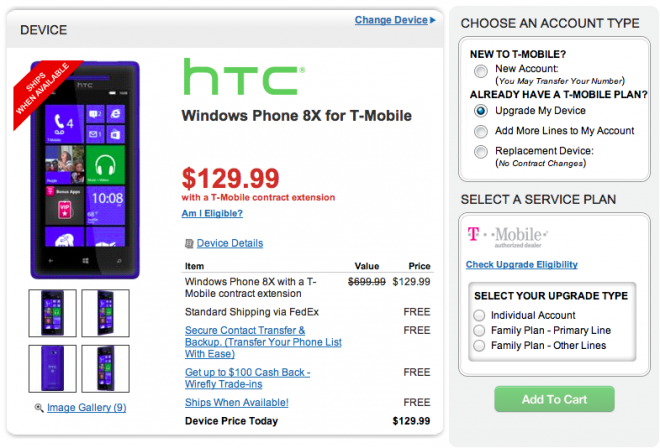 If you want it even cheaper, check out http://www.wmdeals.com/ (Run by T-mobile) can’t beat $74.99 after rebate for the HTC 8X! just so it’s clear, this is only for new activations. I am basing this on past promotions they’ve run through the site. People have been able to upgrade through wmdeals. Take a look at howardforums. They also have they Lumia 810 for $25 after MIR. Unfortunately it appears to require Classic unlimited plans. Hey it doesn’t work through upgrades, but i was able to call and tell them that i was going to cancel because the phone cost too much. I told them the prices i found at wirefly and through the sales department and they gave me the phone for $125 with a $50 rebate. Any Catch there? anyone can order from wmdeals? I am eligible for upgrade early but only through t-mobile. I called t-mobile loyalty and the “best” they could do was $200 with a $50 mail in rebate. My current phone is barely working and i dont know if I can wait until december 4th to upgrade from wirefly. I guess i can try and call again and see if they might give me a better price. Son of a………highway robbery! Just paid $311 at the Tmo store after taxes and all for the 8X and $208 after taxes for the 810. Both have the $50 rebate but stil…….I think I paid double SMGDH!